Federal and State privacy laws over the last few years require all employers to review how they are maintaining their records on employees. Gone are the days where every piece of information on an employee was filed in the “personnel file.” The primary driver behind this is Health Insurance Portability and Accountability Act (HIPAA). Employers should restrict access to employee information and establish a policy for whom within the company is permitted access. ASAP HR Solutions have user-access permissions that can help. However, the majority of small employers are using outside file storage methods which should be reviewed. Whatever system you chose, you should design it so that you're limiting access to your employee's sensitive records while also enabling supervisors or other qualified managers access to day-to-day employee records such as job descriptions, pay history changes, and reviews. 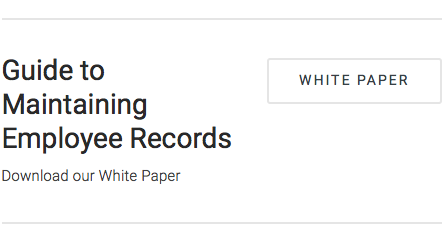 To receive a free in-depth white paper, "Guide to Maintaining Employee Records", courtesy of Ned Frazier of Frazier International, please submit this request form.